This is one of my favorite photos from my 2014 wedding season. Raychel and Peter were lucky enough to have a nice fall day to have their wedding. They had a nice outdoor ceremony and did photos before the ceremony. We went outside before the guests arrived and let them just hang out and talk. We had them go for a walk and then took photos of them in a casual setting. I loved the water fountain that was outside the vineyard and wanted to be sure to capture it. 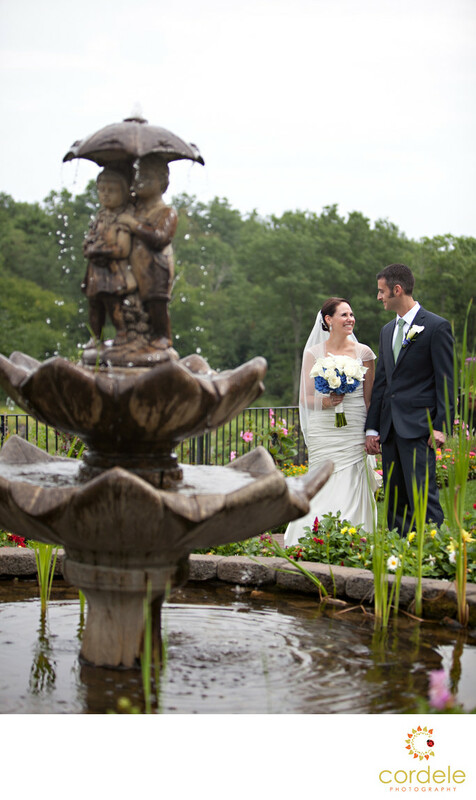 Zorvino Vineyards makes for a great backdrop in New Hampshire weddings. Raychel and Peter really wanted simple yet classic wedding photos. Raychels flowers have a hint of blue. The green lush vineyards in the background give a way for them to stand out. The fountain in the photo is of two kids in the rain, with an umbrella. It was fitting as the weather was touch and go all day. We were worried it was going to pour rain as it had been all morning. We were lucky enough to beat the rain, and get a clear day. It would have been a real bummer had it rained as the entire point to a wedding at the vineyard is the red barn outside and the vineyards. The photo opportunities in the vineyards cannot be missed. We were lucky enough to not be past the flowers in season so the entire session we were able to pull in pops of colors.